Speaking up for yourself, asking questions, taking initiative, and joining in can be hard for anyone, but with a little practice, you'll breeze through even the stickiest of situations! Sometimes it can be hard to ask for things you'd like to have. Sometimes it can be hard to tell someone you don't like what they are doing, and ask if they could stop or help you in a different way. Although these things are difficult, they can become easier with a little thought about how you would like to handle these situations, and a little practice finding the right words to say. Former elementary school counselor Melissa Riccobono created a role playing game just for you, so you can practice what to do and say in different situations. Melissa holds a BA in Psychology and an MS in Counseling Psychology. 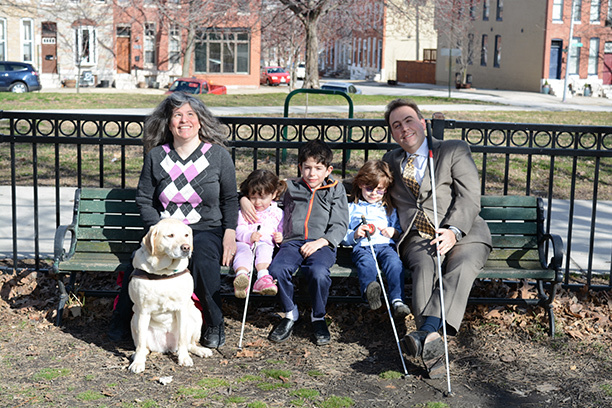 She is also a blind parent of 3 children, 2 of whom are blind. She has crafted these role playing scenarios from her own experiences and the experiences of her children and students. Give this game a shot! Below are some example scenarios you might experience in the future or may have experienced in the past. Read them and ask yourself, "What would I do in this situation?" Then, find a partner such as a family member, teacher, friend, or classmate and act out each scenario as a way to practice the responses you feel comfortable with — the things you would like to say or do in these situations or situations like them. The more you practice, the less nervous you will be if they happen to you in real life. If you are unsure what to do, we've given you some ideas for each situation. You are in the lunch line and the person behind the counter asks your friend what you'd like to eat. Politely say, "This is my lunch. Could you please ask me what I would like?" You are in the lunchroom, and you want to sit at a table with your friends, but you don't know where they are sitting. Call their names so they can tell you where they are. Ask an adult or other student to look for your friends and tell or show you where they are. Ask your friends to sit at a certain table each day so you can find them more easily. You are trying to walk to your classroom. You know exactly where you are going, but someone comes up to you, takes your arm, and says they will help you get where you're going. Tell them you are fine, and ask them to please let go of your arm. Invite them to walk with you to show them that you know where you are going and how to get there on your own. If they still insist on walking you to your class, ask them to please let you take their arm; it is much more comfortable, and actually safer, to walk this way. And, as a bonus, you can still use your cane, if you have one, in your other hand so you still have some control of the situation. Your friends are drawing pictures and laughing about them. You cannot see the pictures, and you want to understand what is so funny. Ask your friends to describe what they are drawing. Tell them that it hurts your feelings when you feel left out. Ask them how they would feel if you wrote something in braille and laughed about it and they couldn't read it. You really want to play a game at recess, but someone says, "You can't play. You're blind!" Tell them that you can play the game. Ask them to let you show them how you play. If it's a game you haven't played before, ask them to tell you the rules and figure out a way you can play. Ask another blind friend if they have ever played the game and how it's played. Practice the game with friends or family and then come and start the game at recess and ask others to play with you. Ask your TVI and/or O&M instructor to brainstorm ways to adapt games or practice activities with you. You really want to help your mom with a chore, but you aren't sure exactly what you need to do. Ask your mom to show you, or explain to you again, how to do the chore. Ask your TVI to show you how to do the chore so you can surprise your mom. Your friend runs away from you on the playground to play with someone else. This makes you feel sad. Talk to your friend about how you feel. Figure out a way that maybe all of you could play together. Find another friend to play with instead. You really want another piece of pizza, but you don't know where the pizza is, or if there is another piece left. Ask someone to tell you where the pizza is, and whether there is another piece left. If they offer to get the pizza for you, you could say "yes, thank you" or you could say you would rather get the pizza yourself and then ask for some directions. You are in class and you can't see the board, or your teacher has forgotten to give you a braille copy of a worksheet the class is using. Tell the teacher you can't see. You are in a group of people you have never met before. You are sitting at a table all by yourself, and everyone else seems to be sitting at other tables around the room. You feel very shy, but you still do not want to sit by yourself. Get up and go to a table where you hear people talking. Ask if there is a seat at the table. Ask the people their names, or try to join in the conversation they are having. Unwanted physical contact is an all-too-common experience for both blind children and adults. It is critically important blind kids learn that their bodies belong to them, and that they have the right to feel safe and to set boundaries. Adults sometimes pull, push, grab, or otherwise direct blind children because they want to keep them safe or are in a rush to get somewhere. But blind children who aren't allowed to navigate and explore independently will have a harder time developing vital travel skills. They will also struggle to respect the personal space of others if they aren't encouraged to demand respect for their own personal space. For specific ideas and guidance on how to encourage and support your blind child in this incredibly important area, see my article "My Body Belongs to Me!" Without visual cues, blind kids sometimes need a little help getting acquainted. Check out these tips from FamilyConnect.